Davis Square in Somerville, MA. is starting to really hold a place in my heart…or more accurately, my stomach! The eclectic neighborhood is home to markets, coffee shops and eateries that have a bohemian feel that you don’t get as much from other Boston suburbs. For two Boston Brunchers events in a row now, I have traveled to this neighborhood to be spoiled. Last month I was able to enjoy the down-home southern deliciousness that is brunch at M3, and this month I had the chance to indulge in a Mexican brunch unlike anything I have tried at the Painted Burro. As I sat down with the Brunchers, we were greeted with fresh tortilla chips, smoky house-made salsa, and … wait for it…. HORCHATA ICED COFFEE!! Seriously. If brunch had ended at this point I would have left completely happy. The drink is exactly what the name depicts, iced coffee mixed with horchata, a traditional Mexican sweetened rice drink. The result is a refreshing, lively morning beverage that tastes just like eiskaffe! Apparently my brunch would not only include this nectar of the Gods. Every good brunch includes appetizers, and ours started with goat empanadas made with fresh local goat and sitting on top of a stellar roasted red pepper and tomato-chipotle salsa. The sauce was the star of the dish, and I sopped it up with left over tortillas. Next we tried the Fundido which was a pot of perfectly melted, gooey Oaxaca, Chihuahua & Manchego cheeses topped with house made chorizo. 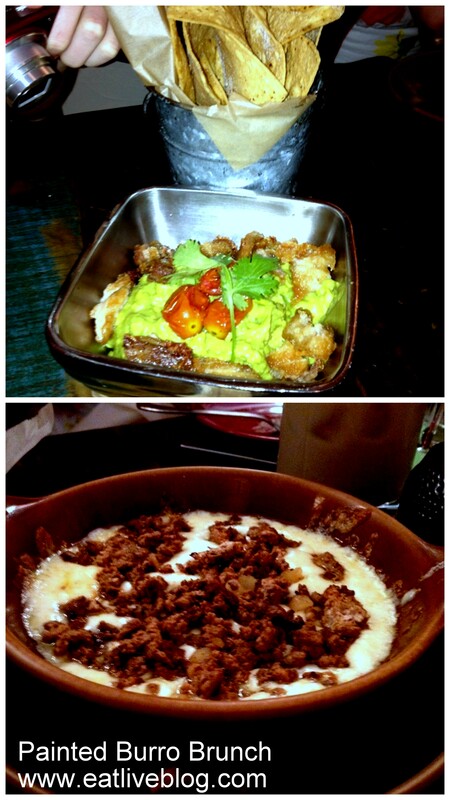 I am still dreaming about that damn Fundido….Our final appetizer was the Guacamole “El Mero Mero” topped with pork belly. The quac was delicious and fresh, and the perfect appetizer to cleanse our palates before the main event. Luckily for me, my favorite Brunchers sharing partners Rachel and Liz were as indecisive as me in ordering, so we decided to join forces and split 3 dishes. Even luckier, all Boston Brunchers are fabulous sharers and I am pretty sure we got to taste almost everything on the menu. 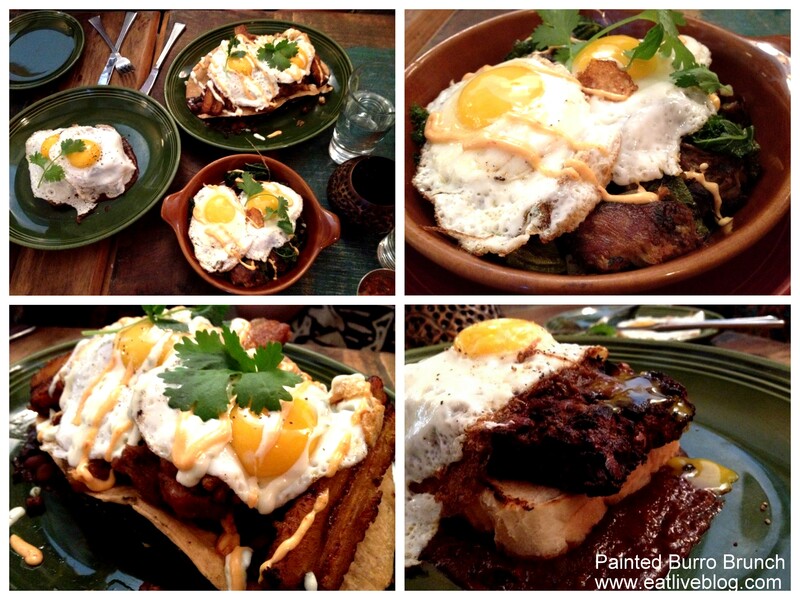 For our dishes, we shared the Yucatan Meatloaf, the Vaquero Hash and the El Montanero. Everything was well prepared, with the taste of slow, deliberate cooking methods shining through in all of the dishes. However, the El Montanero REALLY shined through. 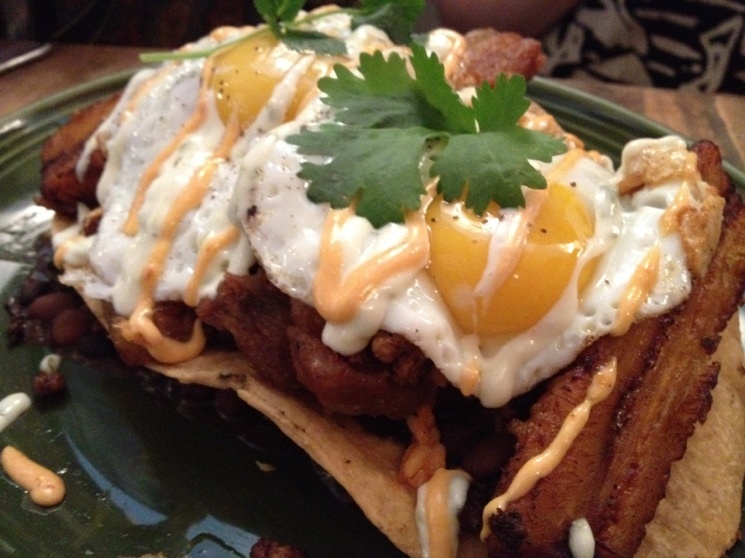 El Montanero is a beautiful pile of 2 fried eggs, chorizo con papas, charro beans, chicharron, fried plantains, burro rice, chipotle mayo and baja cream all on top of a crispy tortilla. Every bite was sweet, salty, spicy and smooth all at once. In a word, it was amazing. Another amazing dish, Chilaquiles “Del Paraiso”. This ovo-vegetarian dish was made with a salsa verde that I wanted to drink it was so good. 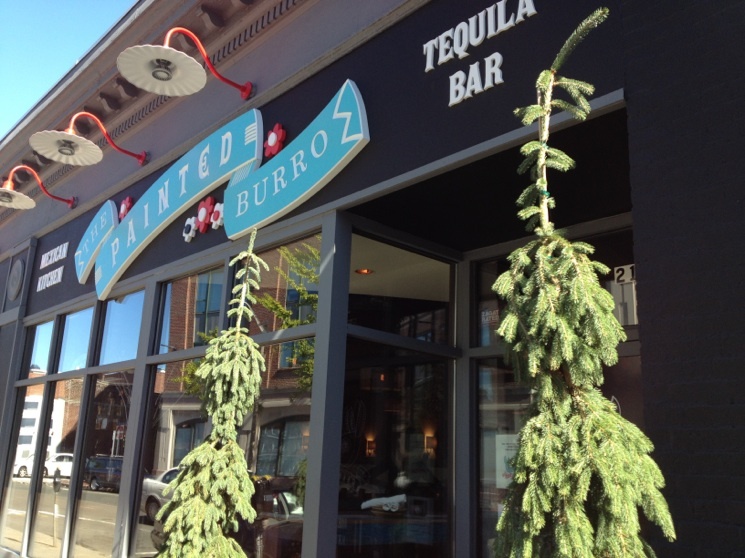 Next time I am at The Painted Burro it is going to be hard to choose between these two. Guess I will just have to bring my good sharer friends with me again! 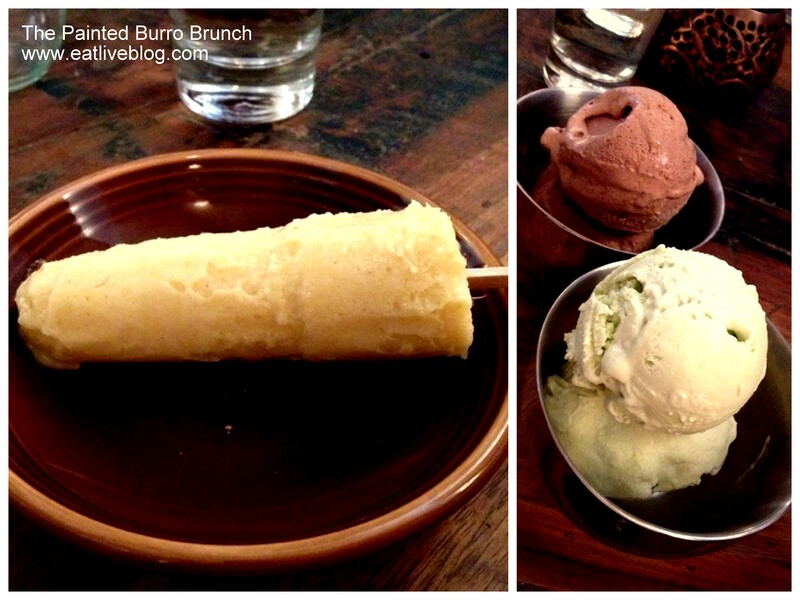 Naturally a good brunch will end with a delicious dessert, and the Painted Burro did not disappoint here either. The eatery makes their own helados, or mexican ice cream. The favors rotate since it is home made. Our choices that morning were Chipotle Chocolate and Coconut Avacado. Yes and yes. The ice cream was smooth and delicious. The chipotle chocolate had a rich, dark chocolate favor that was followed by a spicy burn in the back of your throat that was perfect. Had we only had ice cream, we would have left happy. But luckily Painted Burro connoisseur Richard was at brunch with us and knew to ask about the house-made popsicles. That days popsicle of the day: corn. Seriously! It was unusual, and fantastic. 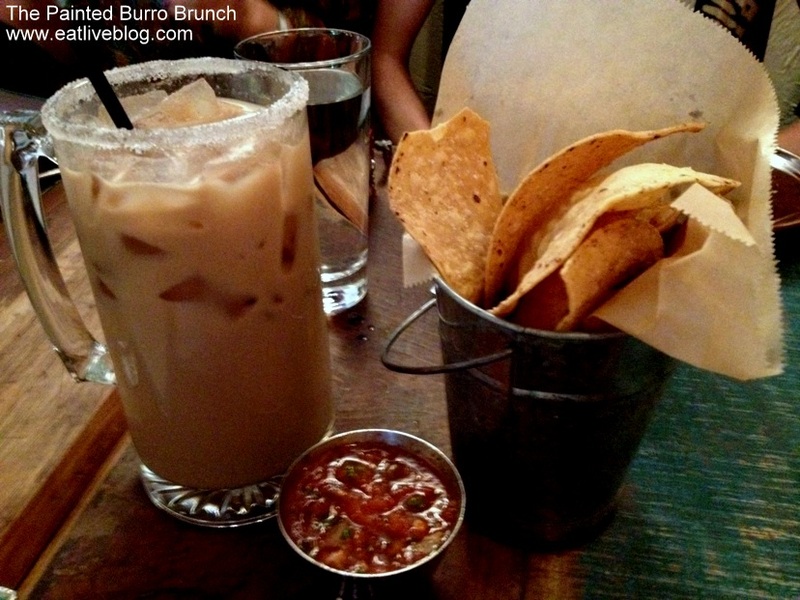 Our brunch at The Painted Burro was wonderful. The service and the unique food really sets the brunch apart from many others in the area. If you are looking for something different and delicious, I couldn’t recommend this brunch more! Disclaimer: This brunch was provided to The Boston Brunchers free of charge. We only paid gratuities. However, as always, all opinions are 100% my own! This entry was posted in Reviews, Travel in New England and tagged boston, Brunch, mexican, review, somerville, The Painted Burro by reneeh. Bookmark the permalink. I took like 90! It was so hard to get a good picture of! I am SO bookmarking this to hit up next time we’re in MA! The in-laws just relocated back there, so we’ll have lots of opportunities. Horchata is something I have always wanted to try, so that will DEFINITELY be on the agenda!! You’ve made me hungry for brunch all over again! this makes me want brunch…right now. Looks delicious! Great recap of this delicious meal – I was so happy to share with you and Rachel. Best way to brunch! Definately a place to take your mum when next I visit. It looks and sounds amazing!